The SEAMetal SD Aerosol is a double seam inspection system for aerosol cans. This is a destructive system, which requires cutting a section of the can in order to ensure that the double seam is hermetically sealed and will not leak. This test can be done once or twice a shift, and utilizing statistical analysis and trends, operators can determine if there are problems which many need correcting or further investigation. 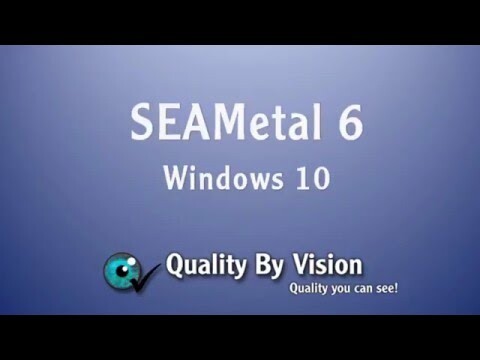 This version of SEAMetal is easy to learn and the most user-friendly in the industry! New version 6.0 offers SEAM doctor, which helps you in determining the root cause of the issues you are seeing and assists you in fixing them! So, high accuracy, high resolution, fast and repeatable double seam evaluation systems are now needed more than ever. SEAMetal SD is the third generation of double seam test equipment from Quality By Vision. The company has never stopped improving and developing this system since 1993, when it produced the world’s first computerized fully automatic double seam test system: SEAMetal 9000X. This latest system introduces an integrated High Definition camera, providing an unprecedented look at the aerosols can’s double seam. You can now see the image better and get a much more accurate measurement! The software runs under WindowsTM operating systems (including Windows 7 and Windows 10!). In third party customer GR&R testing, this system was found to have “world class” GR&R ratings! Each measurement can be measured automatically (less than 1 second per image), manually or configured to use an external caliper or gauge. Centering device ensures image is ideal and blocks unwanted light. Tight integration with Excel for automatic, customizable reports! Adaptive detection algorithm – improves accuracy by training detection system with hard-to-detect double seams! Network support – allows secure access to other SEAMetal HD systems through the network, as well as remote report viewing through local and remote network! Supports rechecks – in situations where seamer adjustments were performed. Supports undo to avoid operator mistakes! Communicates with any SPC data collection system! External gauge support (e.g., can height, flange width, double seam thickness, double seam length and more!). Optional gauge attachments (e.g., Countersink gauge, thickness gauge).